The Cannon Beach History Center and Museum is located at the corner of S. Spruce Street and Sunset Blvd. in Cannon Beach, Oregon. We are open Wednesdays through Mondays from 11:00 a.m. – 4:00 p.m. Closed on Tuesdays. Admission is FREE, but donations are gladly accepted. Read more about our offerings here. 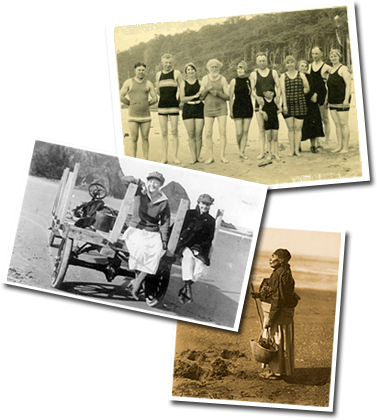 The Cannon Beach Historical Society was originally founded in 1969. After many years of periods of inactivity followed by renewal, a group of former society members and others mounted a first-class exhibit on the history of Cannon Beach in the Clatsop County Historical Society Heritage Museum in Astoria in 1988. Shortly after this, in 1990, the Cannon Beach Historical Society was once again revived. The collection and cataloging of historic artifacts and oral histories began in earnest, and the group commissioned the writing of the book “Cannon Beach: A Place by the Sea,” by Oregon historian Terence O’Donnell. With a gift of land in 1995 and a successful capital campaign, the group started to construct the facility that now houses the Cannon Beach History Center and Museum in 1998. The building went through several phases of development through the years, culminating in the addition of a classroom, oral history studio, and artifact storage area in 2005. The Cannon Beach History Center and Museum now features a permanent exhibit, a Native-American longhouse, and temporary exhibits, including a rotating quilt show. Several programs have been added to the museum’s repertoire in recent years: a field trip program, the Acoustic Folk! music series, a monthly lecture series, and other events both fun and educational. As our visitor base, activities, and collections grow, we strive to keep Cannon Beach’s unique history alive for present and future generations! The Cannon Beach History Center and Museum is home to the original Cannon Beach cannon. This artifact, along with the capstan housed with it, was shipped to Texas A&M University in order to be conserved. The cannon and capstan are back on display at the Museum waiting to be preserved in a temperature and humidity controlled environment. To learn more about the cannon and capstan, click the link below.